The Food Bank of Northwest Indiana’s Portage BackPack Program has grown from providing weekend meals to 10 children in one Portage Township School, to 160 children across all 11 Portage Township Schools. But the need is still great, and Portage Township Schools would like to double the amount of children that are served each weekend of the school year. Portage Township Schools has received amazing support from the community and hopes to increase awareness of the program, as well as financial resources, through their first fundraiser: BackPack to School. As always, 100% of the money raised will go to feeding children in Portage Township Schools. Online donations can be made here, or mailed to Crisman Elementary School (Principal Scott Hufford, Attn: BackPack Program, 6161 Old Porter Road 46368). 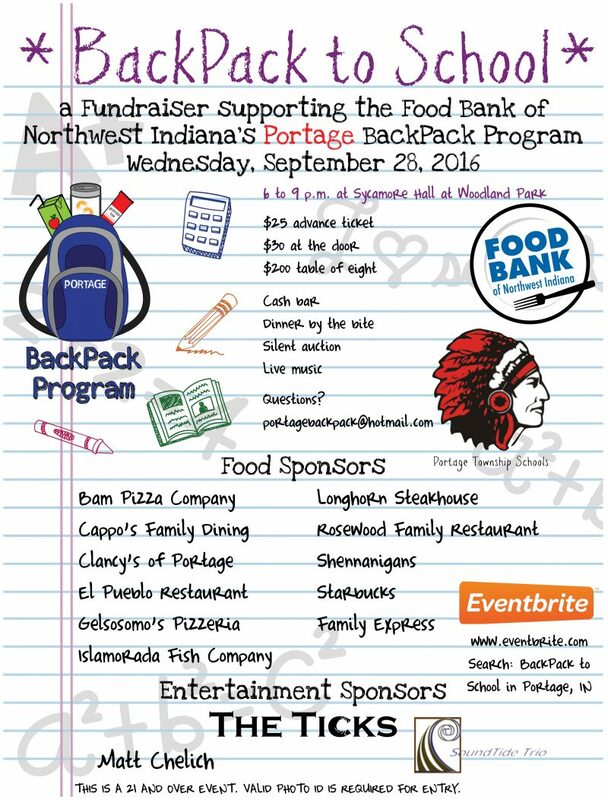 Please make sure to specify the Portage BackPack Fundraiser in either the memo section of your check or in the comments section of the online donation form. Your donation is tax deductible to the extent allowed by law.